As I stood there in the middle of my living room floor watching that oh so familiar screen crawl and soaking in the beautiful John Williams soundtrack, I cracked a smile and began to giggle like a little kid with a new toy. For as long as I can remember, I have wanted to be a Jedi Knight and wielding a Light Saber in Trials on Tatooine made me feel like that just happened! 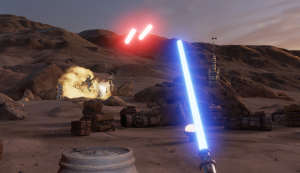 Trials on Tatooine is a free experience that was released this week on Steam. 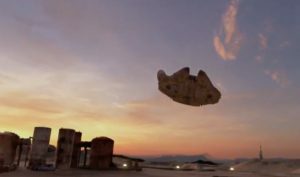 The experience was created by the Industrial Light and Magic X Labs team and is a true extension of the Star Wars Universe. This experience was exactly what one would expect coming from ILM. The look and feel of the experience was as if you had stepped right into one of the Star Wars movies. Needless to say, I just stood there in awe as the Millennium Falcon flew in to land just above me. The ramp descended and I was greeted by the familiar R2-D2 and then instructed by the voice of Han Solo on how to make a few minor repairs to the ship. As all of this was happening, we began to be bombarded by the laser blasts of incoming Tie Fighters and trusty R2-D2 stood waiting to provide me with my gift from Luke Skywalker, a light saber. It was at this point that the real fun began. Promptly an Imperial Cruiser landed and began to deploy legions of Storm Troopers. This was my cue to summon my inner Jedi and defend the Falcon. Grabbing my new light saber I furiously deflected laser blasts back at the Storm Troopers holding off their attacks just long enough for the Millennium Falcon to make its escape. Unfortunately, this is where the experience ended. 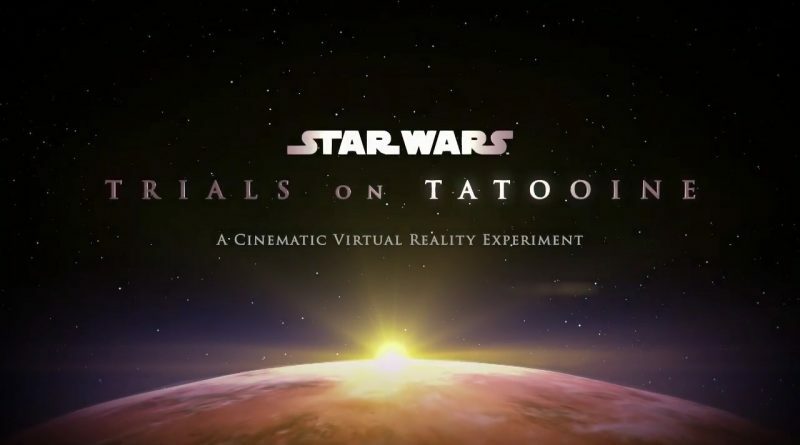 As good as it was, Trials on Tatooine is just a short proof of concept. This experience however left me wanting more in a bad way. 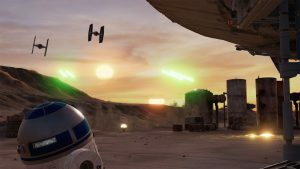 I truly cannot wait now until we see a full fledged Star Wars VR experience or game. 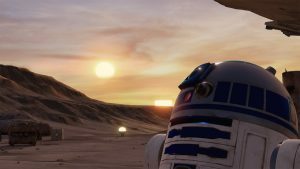 So if you use a Vive or even an Oculus Rift with an alternate controller set up then I highly suggest heading over to Steam and adding this title to your library… You won’t be disappointed you did and as always, May the force be with you! ← OSVR HDK 2 Ships August 12th at $399! Great article! This makes me genuinely excited to try it out as well. Do you or Caleb know if this will work with Razer Hydra? Hey glad you liked it! As for the Hydras, I’m pretty sure it would work since the LEAP did. Both methods are just emulating the Vive controllers. Best thing to do is just load it up and try it man… lemme know if it works so I can update the article.